1. At the beginning of the book, Annemarie doesn’t let anyone in her family watch her as she rides Hurrah, preferring to keep this side of herself private. Do you think that everybody has a secret self, and can hiding an important part of yourself from your loved ones ever be a healthy thing? 2. Annemarie is shocked to learn how hard it was for her mother to send her away to train with Marjory when she was a teenager, just as Annemarie is afraid to send Eva away to train with Nathalie. How hard do you think it is for women to understand their mothers and what they went through in raising them, even when they are going through an identical situation? How difficult do you think it is, in any situation, to get out of your own head and put yourself in the place of the other person? 3. Annemarie runs out on her romantic birthday dinner with Dan after he presents her with earrings instead of an engagement ring. Do you think she overreacted, or do you understand why she was so upset? 4. When Eva fails at her first event, she initially wants to quit riding, just as Annemarie did following her accident more than 20 years before. How difficult do you think it is to brush yourself off and move on after a serious failure? Do you think failure is more likely to ultimately make a person stronger or break a spirit forever? 5. How do you think the loss of the Old Man of the Mountain foreshadows the events that are about to take place in Annemarie and Eva’s lives? Can you think of any other examples of foreshadowing in the book? 6. Annemarie is sure, almost from the start, that she wants to take custody of Jeremy following the death of Roger and Sonja. Do you think that most women would be able to move past their resentments (especially if, as in this case, their husband left them for the other woman) in order to raise the child of their ex and his new wife? 7. After her father’s death, Eva feels guilty for being upset about missing her horse, Joe, instead of focusing solely on her father. Why do you think guilt is so often tied in with grief? 8. 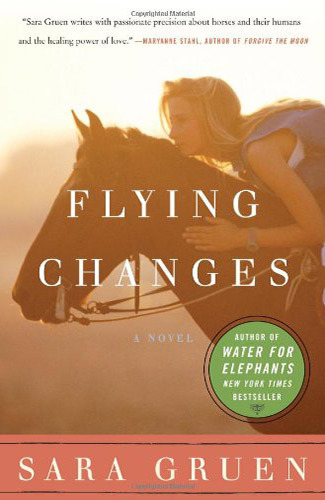 At the end of the book, Annemarie finally lets Dan watch her as she rides Hurrah, and she also makes a jump for the first time since her accident. What life change leading up to this moment, from her marriage to new motherhood to watching Eva make a successful jump at her second big event, do you think was most crucial to Annemarie’s healing?